Cabañas, El Salvador – This Saturday, in Victoria, Cabañas, over 900 people gathered in the blazing hot plaza to celebrate Radio Victoria and the Social Economic Development Association’s (ADES) 25th anniversary. The sister organizations hosted a joint community arts festival to mark two and a half decades of solidarity, support, and dedication to participatory community development, human rights and sustainability. 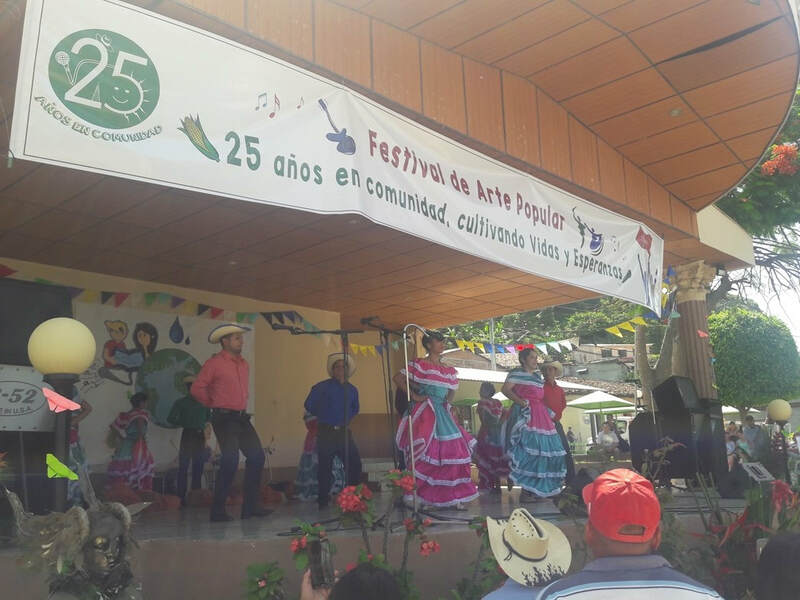 Traditional dance performance at the Community Arts Festival, Victoria, Cabañas (Photo by author). Both organizations’ mandates originate in their struggle to repopulate the town of Santa Marta, Cabañas, at the height of the bloody civil war. Founded by community members on their return from Honduran refugee camps, ADES and Radio Victoria’s first challenge became building and maintaining the social and physical tools necessary for subsistence survival. The speeches, live music, and community dance and theater performances celebrated both organizations’ blossoming successes over the years. 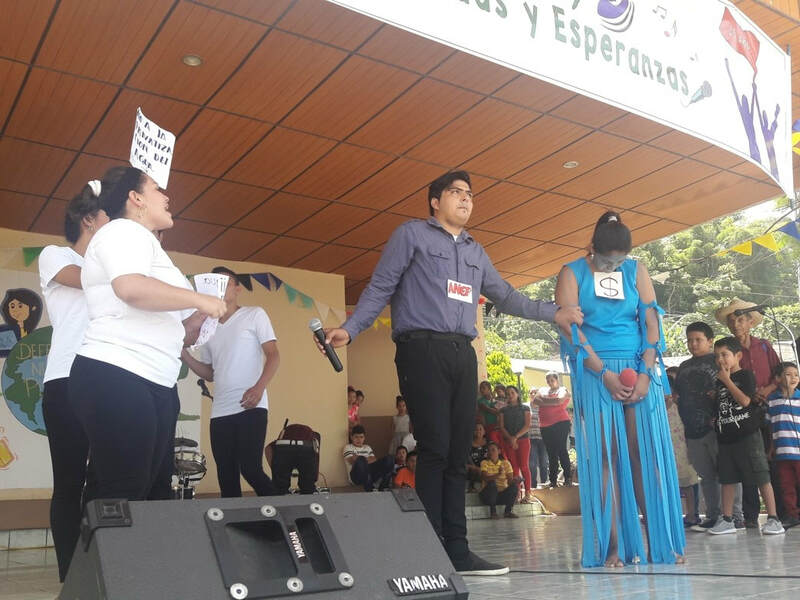 The event, itself, reflected their extraordinary growth and community support as attendees came from municipalities far beyond Santa Marta, including those from other parts of Cabañas, Usulutan, San Vicente and Cuzcatlan. ADES and Radio Victoria’s projects expanded to include fostering literacy, environmental and human rights education, community health, microfinances, organic agriculture, leadership training, youth programs, and women’s empowerment. Their most public success began in 2006 with their resistance to a Canadian-Australian gold mining company (first Pacific Rim, then Oceana Gold) that threatened to contaminate the country’s water resources. ADES and Radio Victoria accompanied local communities to protest the proposed El Dorado gold mine near San Isidrio, Cabañas. The 12-year fight transformed a local outcry into a nation-wide movement with international support. Their organizing drive culminated in March 2017 when El Salvador became the first country in history to ban metal mining. 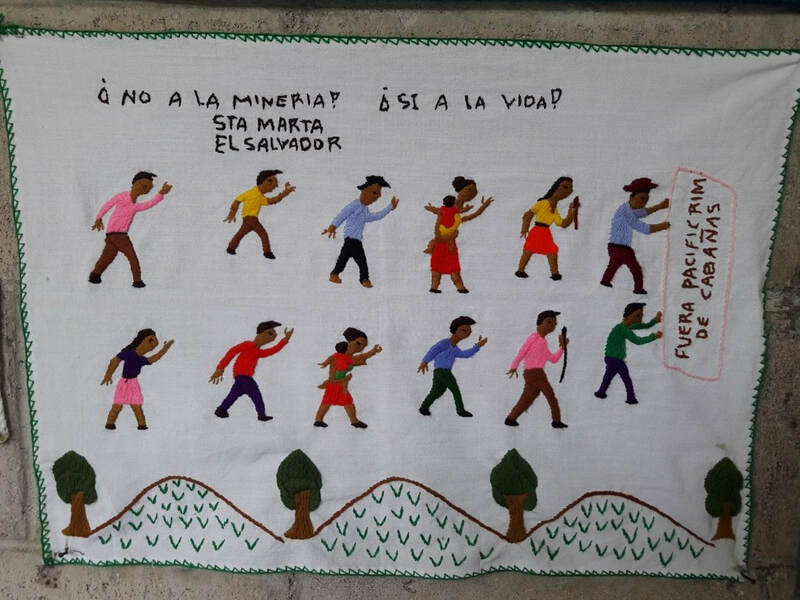 A hand stitched depiction of community organization against mining in Cabañas, hanging in the Radio Victoria office. (Photo by author). 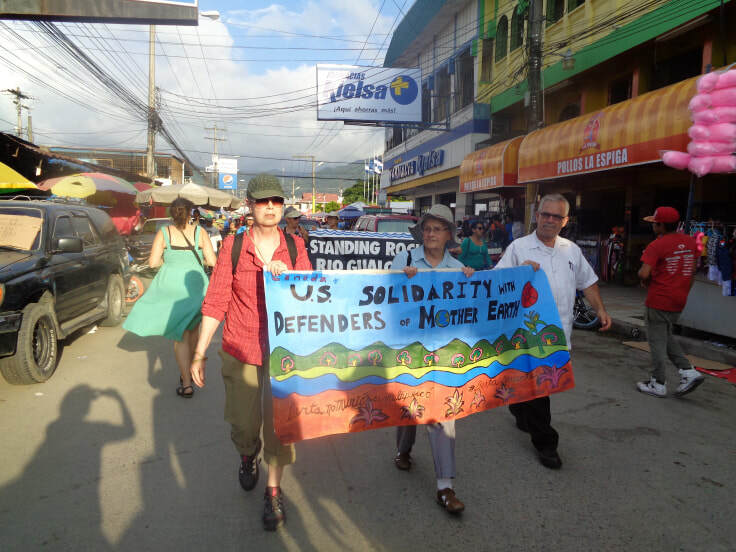 Morales also noted “new threats on the horizon that put at risk democratic aspirations, social justice, and the search for an ecologically sustainable society for the Salvadoran people.” Chief among these is the continued struggle over El Salvador’s water resources. Facing a dire water crisis, predicted to get worse with the effects of climate change, El Salvador remains one of few countries without a general water law. Following years of pressure from El Salvador’s Foro del Agua, an umbrella group of environmental social organizations including ADES, the Ministry of Environment (MARN) submitted a proposed General Water Law to congress in 2012. But not withstanding general consensus on 92 articles of the proposed Water Law, and just three months after the metal mining ban passed, El Salvador’s conservative ARENA party proposed their own water law, with the technical guidance of El Salvador’s National Association of Private Companies (ANEP). The regulatory entity of the ARENA/ANEP law consists of one executive representative, 2 representatives of COMURES (an ARENA dominated group of mayors) and 2 representatives of ANEP. 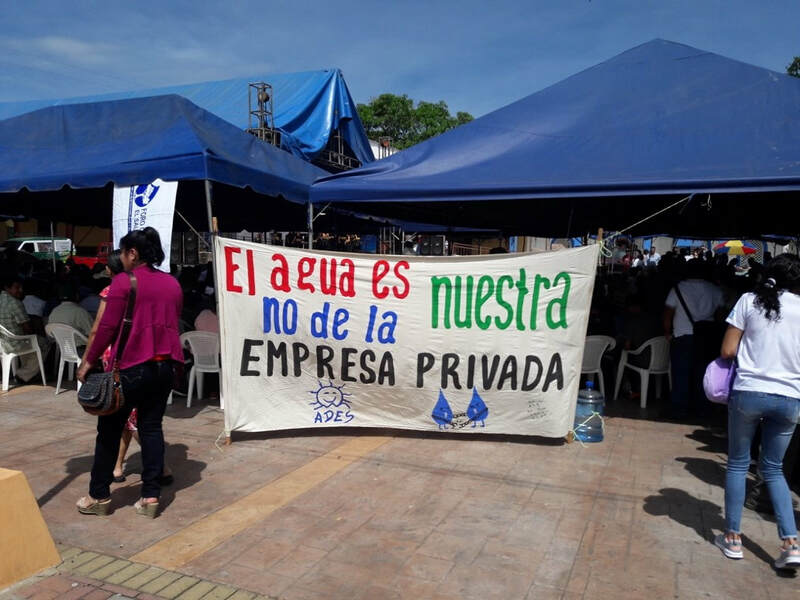 While ARENA claims that their law is not privatization, a growing portion of Salvadoran civil society is concerned that putting water regulation under the decision-making power of private interests would be a de facto privatization. In contrast, a counter water proposal presented by the Universidad Centro America Simeón Cañas (UCA) also in 2017, with supported by the Catholic Church, places regulatory control firmly in the hands of the state. The ARENA controlled congress has momentarily cast aside MARN’s General Water Law in favor of their own. However, despite having the necessary votes to pass it into law, a wave of social protest regarding “who decides” about water regulation has since exploded as a point of contention on the national political agenda. Rallies, marches, and public forums organized by students of the public University of El Salvador (UES), environmental groups, and labor unions have filled the streets of San Salvador. Protestors have taken over highways and airwaves of public and mainstream news outlets. The recurring demand is “no to the privatization of water” and no to the incorporation of ANEP in the regulating body. A Community performance enacting the attempted privatization of water by ANEP. (Photo by author). In his comments to those gathered in Victoria’s public square, Oscar Beltran, director of Radio Victoria, promised that, “Just like we did with the mining issue, we will assume the challenge against the privatization of water.” Later on, a community performance group reiterated this stance. The actors depicted ANEP’s attempt to commodify water (depicted by a suited man slapping a dollar sign on a young woman dressed in a water costume) and the power of an organized community to protect their “human right to water”. Banner at the ninth Anniversary of the martyrdom of Marcelo Rivera in San Isidrio, Cabañas. The banner reads: “The water is ours, it is not the private companies’” (Photo by author). The events speakers included the Monseñor José Elías Rauda, Bishop of San Vicente, Ana Milagro Guevara, the Environmental Secretary General of the Ombudswoman of Human Rights, Omar Serrano, the Vice Rector of the UCA, and Ms. Morales from ADES. They spoke of water as a human right that supports all other human rights—including health, food, sanitation. They spoke against the privatization of a resource so vital to life. They also spoke of the power and necessity of the people to stand up for those rights at all costs. J. Alejandro Artiga-Purcell is a PhD candidate at the University of California, Santa Cruz department of Environmental Studies. This was my third trip with a SHARE delegation to serve as an election observer in El Salvador. On each trip, I have learned more about the history and concerns of the people of El Salvador. Some of it is very disturbing because it involves injustice and murder of innocent citizens by agents of the U.S. government. Our group visited the chapel where Monsignor Romero was assassinated, and we heard some of the details of this horrific event. It seems that in the many years since Romero’s death, information about U.S. involvement becomes more evident. Of course, the U.S. also armed pro-government forces during El Salvador’s civil war, including death squads that murdered thousands of innocent citizens. Yet, Salvadorans choose to settle in the U.S., and one of the largest concentrations is in the area where I live, metropolitan Washington, DC. These great contradictions continue in the policies and practices of our current federal government, which has become very anti-immigrant, and particularly unjust to people of color. I was treated with such warmth and respect during my time in El Salvador; at the polling places, many Salvadorans approached me and asked about where I come from and how I became an election observer; they told me of their travels in the U.S. and several said they had lived in the U.S. for several years. On the most recent trip, I felt uncomfortable to be an American and wondered if anyone would show hostility toward me or other members of the delegation. SHARE does an amazing job of organizing and leading the delegations. On my first trip, for the presidential election in 2014, we spent several days in orientation, including lectures by an economist and visits to historic sites as well as visiting community based programs which were improving the lives of women and the poor. We met with leaders such as a mayor and several mothers of children who “disappeared” during the civil war. We went to candidate forums. We were hosted by a former ambassador at his beautiful home. The SHARE staff held many discussions so that we could reflect on our experiences and ask questions about what we were learning. I feel that all of the activities are very carefully chosen and well planned so that delegates will better understand what is at stake in having a free and fair election process. The other delegates come from all over the U.S. as well as Canada and Mexico. The range of ages and professions was surprising. We had two college students in our group, as well as at least two senior citizens (that’s me!) The thoughtfulness and assistance from SHARE staff who accompanied our group was exceptional. I think the most exciting part of observing the election is the vote counting. When the president of the precinct (table) held up each ballot, it was just thrilling. I wish U.S. elections had such transparency. There is much more I could say about my memorable service with SHARE delegations, but I conclude that I will be returning to participate in a future delegation. I thank SHARE for the opportunity to meet fascinating people and for working to improve confidence in the electoral process. This was an experience like I have never had before. I have been to El Salvador many times over the past number of years. In the past I have been privileged to be part of house building, youth centre construction, water projects and many different ventures. This year I was given the opportunity to be part of an election observation delegation with Share. Share took very good care of us while we were in El Salvador, from transportation from the airport to the election training we required, right down to the smallest details. I saw a part of El Salvador that I hadn’t seen before. We were part of an exciting “rally” in the streets of Tecoluca, where we saw what some would say was the passion or dedication that political party affiliation might bring out in people. We had the opportunity to meet with people from different communities we visited and heard the different stories people wanted to share with us. I thank Jose for the opportunity, I thank Sophia for her organizational skills and Claudia and Anabell for their skillful logistics in country. For those considering working with Share, from my experience, they are a great organization to work with. May my God continue to with and through this organization. Esta fue una experiencia como nunca antes. He estado en El Salvador muchas veces durante los últimos años. En el pasado, tuve el privilegio de ser parte de la construcción de viviendas, construcción de centros juveniles, proyectos de agua y muchas empresas diferentes. Este año tuve la oportunidad de ser parte de una delegación de observación electoral con Share. Share nos cuidó muy bien mientras estábamos en El Salvador, desde el transporte desde el aeropuerto hasta la capacitación electoral que requeríamos, hasta en los detalles más pequeños. Vi una parte de El Salvador que no había visto antes. Fuimos parte de una emocionante "manifestación" en las calles de Tecoluca, donde vimos lo que algunos dirían que era la pasión o la dedicación que la afiliación a los partidos políticos podía generar en las personas. Tuvimos la oportunidad de reunirnos con personas de diferentes comunidades que visitamos y escuchamos las diferentes historias que la gente quería compartir con nosotros. Le agradezco a José la oportunidad, agradezco a Sophia por sus habilidades organizativas y a Claudia y Anabell por su hábil logística en el campo. Para aquellos que consideran trabajar con Share, según mi experiencia, son una gran organización para trabajar. Mi Dios continúe con y a través de esta organización. [San Francisco, CA] Jan. 23rd, 2018 – 50 faith leaders and social justice advocates from the United States will fly to Honduras on Jan. 24th for a week-long visit to observe continuing widespread civil unrest and protests in the aftermath of the contested presidential election on November 26th. The delegation seeks an immediate end to the state-sponsored violence, bloodshed and arrests that have been ongoing since the elections; a halt to Honduran military and police attacks on human rights defenders, land activists, journalists and other advocates; suspension of U.S. financial support for the Honduran security forces; and meaningful broad-based dialogue ― with the participation of an international mediator trusted by all involved ― that leads to a peaceful resolution to the crisis. The delegation is in response to requests for accompaniment and international presence from prominent Honduran religious partners who have faced recent threats. The delegation will arrive in Honduras on Wed., January 24th, and will hold an ecumenical event that afternoon, followed by a press conference at the airport in San Pedro Sula. 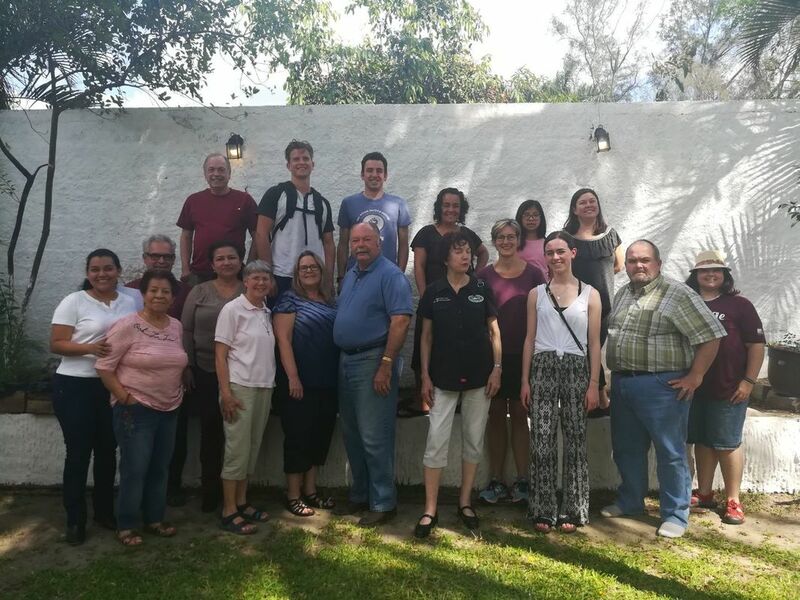 The delegation will also meet with numerous groups and individuals, including members of the Society of Jesus in Honduras, local faith and community organizations, victims of the recent crackdown, and attorneys. On Friday, the delegates will participate with local parishes in a Vía Crucis (Stations of the Cross) procession in Progreso. Opposition leaders in Honduras have called for a national strike from Jan. 20th to 27th to bring attention to their demands for an end to the violent repression of peaceful protesters, a call for internationally mediated national dialogue that is broadly representative of the Honduran people, and the removal of President Juan Orlando Hernández from office. Even before election day, the legitimacy of Honduras’ latest presidential elections was questioned by many who noted that the constitution forbids presidential re-election. Incumbent president Hernández stacked the Supreme Court, which ruled (also against constitutional process) that he could proceed with a re-election campaign. According to OAS (Organization of American States) and EU (European Union) election observer missions, as well as many major media reports, the November 26th presidential election in Honduras was marked by numerous and widespread irregularities, including several cessations in the vote counting after an initial count of 57 percent of the ballots showed opposition candidate Salvador Nasralla with a lead of almost 5 percentage points (the electoral authority claimed the voting trend then sharply reversed, until Hernández was in the lead). After careful review, the OAS called for a new re-election. The electoral authority’s official announcement that Hernández had won sparked renewed protests that intensified after the election was certified on December 17th and immediately, and prematurely, recognized by the U.S. State Department. More than 30 people have been reported killed, with many hundreds more either injured or detained, and the Honduran government had suspended constitutional rights, giving the army and police additional authority to interfere with and disband protests. Since the election, social justice advocates and religious figures have been victims of harassment and death threats.